The most logical and often used form of writing a book or composing a piece of music is to start at the beginning and finish at the end. This does indeed make sense of course but sometimes circumstances call for something different. With the subject matter of this tone poem being so powerful, and the ending of the story full of triumph and boundless joy, I decided I would have to begin by composing the end and make sure that the very first note onwards would develop, lead to and culminate in this ending. ​So I began by writing the ‘Praise/God’ motif that appears in it’s most grand form when the main character Christian finally arrives at the Celestial City, but also when God intervenes in a direct way and at times when Christian triumphs through Christ. This motif had to be triadic because the triad derives from a law of nature - the harmonic series. The motif had to be in a major key to depict joy and triumph and had to be at a moderate tempo to represent grandeur and majesty. It was also important that the motif had a sense of rising in order to reflect the ascension of Christian to heaven. ​The order of the first three notes of this motif was so important. With the second note rising to the third note it creates a sense of hope and longing which aptly characterises Christian’s journey. Had the order of the second and third notes been swapped around the second note would fall to the third note giving not such a hopeful character. And I paid attention to this when composing the ‘Sin’ motif. The sin motif had to be the opposite to the praise motif, therefore I reversed the order of the triad opening so that it would fall to the third note instead of rising. Not only this but I transformed the motif into minor tonality and inverted the entire melody so that instead of the ascending arpeggio, the arpeggio would descend into the depths of sin where Christian found himself at the beginning of the story. ​Pilgrims Progress is a journey of darkness to light, death to life, despair to great joy. I strived to portray this in my tone poem as a whole, and especially in the construction of these two interrelated themes that were the seed of all the thematic material that would follow. Amateurs have all the fun!.. But on these occasions wouldn’t it be fair to say they are just doing their jobs, turning up for work, performing with technical brilliance and efficiency? The main difference between a professional orchestral player and an amateur one, is that the professional is paid to play and the amateur pays to play. The professional has to turn up, the amateur chooses to turn up. The amateur pays for the privilege of performing great music with their friends who all share in the same passion of performing in an orchestra. The amateur invests in the fun of rehearsing, the rewards of personal and collective improvement and the gratification of performing beyond themselves on concert day. ​Having said that, for those professionals that do love their jobs, and I would say that most professional orchestral players do; the joy of the music is amplified by the technical and musical capacity of the players and conductor. The expressive power, nuance and flexibility of the top orchestras can be breathtaking. Just have a look at the video below for proof! And the joy of being in that moment and to be a part of creating it is a great pleasure of course. One might argue that the professionals have the edge in attaining more fun due to the standard of their performances. ​However, amateur orchestras can be pretty good too! In fact, I have always felt uncomfortable using the word amateur when referring to the amateur orchestras that I have worked with both as conductor and composer. These orchestras often include instrumentalists who were previously performing in top professional orchestras and have either retired or have taken a different career path and still want to perform with an orchestra recreationally. There are also those who performed in the National Youth Orchestras previously but went into other professions keeping music as their hobby. These orchestras don’t shy away from repertoire that is a challenge even for the professionals and are an absolute pleasure to rehearse and perform with! In an age where technology is our friend, where the TV, iPad or social media keep us company, and genuine social interaction is at an all time low, being a member of an amateur music group of any sort is a fantastically socially engaging thing to do. Not only are the break time chats a great time to reconnect with human beings!… but also the music making itself is an act of engaging with those around you, listening and connecting with those you are performing with. And without the pressure of expectation that comes with being a professional musician, the amateur would have a good case for saying they have all the fun! What would you say is the best thing about being an amateur musician? ​Having been invited in December 2017 to conduct the historic Chester Philharmonic Orchestra on June 30th 2018, I soon received an email regarding the programme for the concert. A twenty minute hole was still to be filled and I was invited to make a suggestion. In the end I made two suggestions: firstly Mozart's Haffner Symphony and secondly I somewhat audaciously offered that I compose a piece especially for this concert entitled Celestial City! Very bravely the Chester Philharmonic chose for me to write this new work and so the composing work began. At the time of composition I was reading John Bunyan's epic book Pilgrim's Progress. The plot centres around the main character Christian's perilous journey from the City of Destruction to the Celestial City (Heaven). 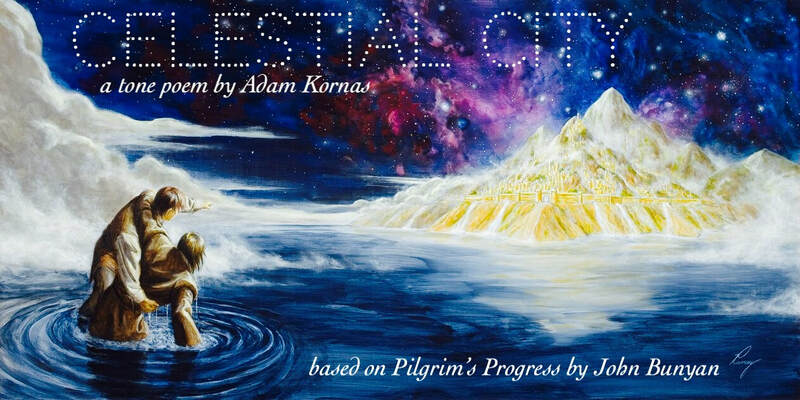 I chose for Celestial City to be the title for a couple of reasons. Firstly the words have a nice ring to them and represent somewhere magnificent and triumphant (a character I wanted to the music to rise to). Secondly, the title would compliment another piece in the concert, Quiet City by Aaron Copland. I have always admired the tone poems of Richard Strauss and the epic structures of the Bruckner Symphonies and the story of Pilgrim's Progress gave me the opportunity to compose a story inspired work on a grand scale. Welcome to this website dedicated to the composition Celestial City. This piece has been a labour of love inspired by the wonderful book Pilgrim's Progress by John Bunyan. My name is Adam Kornas, a conductor and composer based in Liverpool. As well as discovering this composition through my blog, pictures and other media, you have the chance to contribute retrospectively towards the work on the donate page.